Though the stage playoffs have no impact on the regular season nor the League playoffs, they do provide a cash prize for the proven top team of each stage—$100,000 for the winner, and $25,000 for the runner-up, plus bragging rights. The first map, Junkertown, did not start well for London. Kim “Pine” Do-Hyeon was thorn in the Spitfire’s side, peppering them with sniper bullets and flanking their less durable heroes. In extra rounds, the Excelsior ran over a surprise tank strategy from the Spitfire and secured the early advantage. Headed to Oasis next, the New York players shone on the control map. 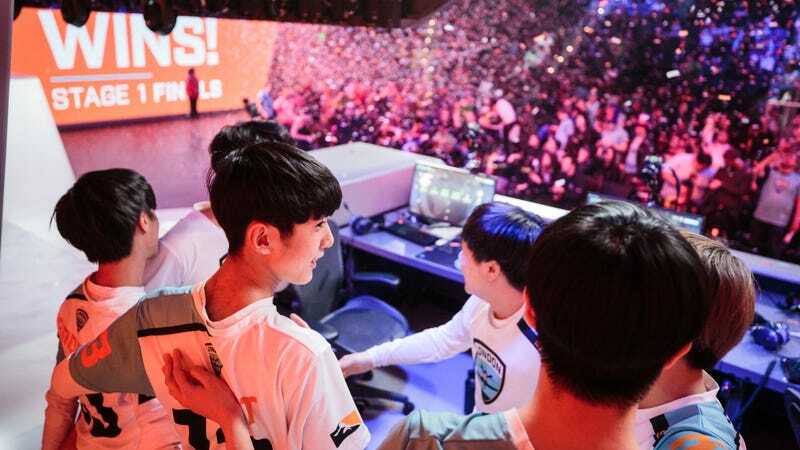 Park “Saebyeolbe” Jong-Ryeol and Bang “Jjonak” Seong-Hyun both had stellar performances, and it seemed the finals might end in a sweep. But on map 3, London started to recover. A quick offense round gave way to a stalwart defense from the Spitfire. The Excelsior would crack their defenses, but London forced them to take their sweet time doing so. In extra rounds, the Spitfire out-capped New York and kept the series alive at 1-2. The fourth map gave London even more confidence, as players like Kim “Birdring” Ji-Hyeok started to outplay their Excelsior counterparts. Birdring’s pick-offs as Widowmaker were the silent killer of New York this match, frustrating its offense at every turn. The Excelsior, meanwhile, continue to force a Genji-Tracer dive composition that isn’t making the kind of impact you would want from your damage-dealers. London take the map and tie it up at 2-2. Of course, it all came down to one map. As the clock ticked into the early hours of the morning for the Spitfire’s home crowd in London, the final clash on Dorado would determine the stage 1 champions. The Spitfire exhibited a strong offense, with one moment in particular showing the team’s ability to capitalize on openings and take a mile when given an inch by the Excelsior. The Excelsior meanwhile continued to push their Genji-Tracer strategy, hoping against hope it will click. This was not the same New York from maps 1 and 2—it seemed like London had shaken their confidence in the run-back, and now New York seemed unsure of itself. Those little hesitations would be costly, as New York failed to push the payload as far as it needed to go and fell to London, 3-2. The London Spitfire can now claim itself the champion of stage 1, taking home a cool $100,000. The Overwatch League is on a short hiatus now, but will return February 21, where a rematch of London and New York will headline the first day of stage 2.